1 of 8 Heat oven to 375 degrees F. Lightly coat 15 x 10 x 1-inch baking pan with nonstick cooking spray; line bottom with waxed paper; coat with spray. 2 of 8 Sift together flour, cocoa powder, baking powder and salt into medium-size bowl. 3 of 8 Beat egg yolks in clean medium-size bowl until fluffy. Gradually add sugar, beating until thick and lemony, 3 to 5 minutes. Add 1 teaspoon peppermint extract; stir in the water. Fold in flour mixture. 4 of 8 Beat egg whites with clean beaters in clean medium-size bowl until stiff and glossy peaks form. Gently fold a spoonful of whites into yolk-flour mixture; fold in remaining whites. Spread evenly in prepared pan. 5 of 8 Bake in 375 degrees F oven 12 minutes or until center springs back when lightly pressed with fingertip. Turn cake out onto wire rack. Gently peel away waxed paper; let cake cool completely. Then slice crosswise with serrated knife into 3 equal pieces. 6 of 8 Sprinkle gelatin over 1/4 cup cream in small saucepan; let stand to soften, 5 minutes. Place over low heat, stirring to dissolve gelatin, about 5 minutes. Let cool. 7 of 8 Beat gelatin-cream mixture with remaining 1-1/4 cups cream and 1 teaspoon peppermint extract in small bowl until stiff peaks form. Fold in crushed peppermint. 8 of 8 Place 1 cake section on platter; spread top with a third (about scant 1 cup) of peppermint cream. 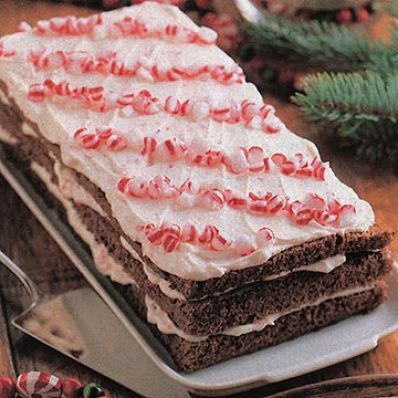 Stack with remaining cake and peppermint cream. Decorate with crushed peppermints, if desired. Per Serving: 9 g sat. fat, 32 g carb., 4 g pro., 134 mg chol., 16 g Fat, total, 198 mg sodium, 1 g fiber, 279 kcal cal.